By all accounts, BOOKED OUT is a charming art house romantic comedy with many redeeming features: an eminently watchable, quirky cast, a sweet story-line, and a message wrapped within all the dysfunctional activity and frenetic picture-taking going around the neighborhood. Booked Out follows the quirky exploits of the Polaroid-loving artist Ailidh as she spies and photographs the occupants of her block of flats. Jacob, the boy next door who comes and goes quicker than Ailidh can take pictures. Jacqueline, the mysterious girl that Jacob is visiting and the slightly crazy Mrs. Nicholls who Ailidh helps cope with her husband’s continuing existence after his death. As Ailidh gets closer to winning Jacobs affection the world that they all live in will be changed forever. 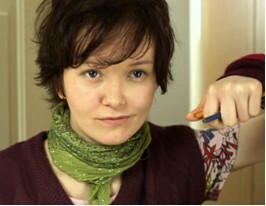 BOOKED OUT is the first film by Scottish writer/director Bryan O’Neil. And it hits the mark. We recently connected with Bryan and Jordan Cushing, the film’s Director of Photography (or “Cinematographer”, depending on your preference). Ironically enough, both BOOKED OUT and SIDEKICK, a hugely popular Canadian comedy that Jordan was cinematographer on (or is that “Director of Photography”? 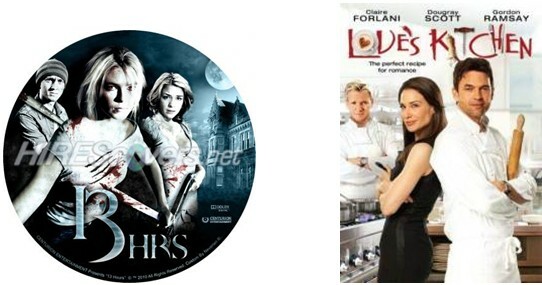 ), both have comic book elements built into the films. So what better venue than InvestComics to introduce them and share their work? 1) Bryan, first off a huge congratulations on getting your film made. What got you over the hump from “kicking the tires” to actually buying the car and getting it done? And what was the inspiration for the story which is has many common themes but is also utterly unique? 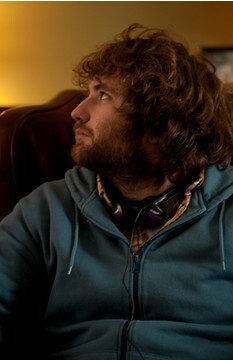 (BRYAN:) I had been writing a scripts on and off for about four years with the overall goal of making my own films. As I reached the end of each script, I was left thinking that it was an achievement to have finished it but that I was glad it was over. BOOKED OUT was completely different. I was more excited about the project when I finished the script than when I started it, and about half way through writing it I knew that I was going to make it one way or another. There is that moment where you set a completely unrealistic deadline and then try and stick to it. Mine was to shoot the film within nine months of finishing my first draft. I didn’t quite make it in that timescale but we were on set within thirteen months, so not too far off. The initial inspiration for BOOKED OUT was a reaction to the previous script I had been writing. It was a multi-stranded thriller. And by the end of it I didn’t know why I started writing it. It made me think of the films I love, the ones that totally connected with me. That was more your American and European indie films like Little Miss Sunshine, Rushmore, Amelie and Goodbye Lenin. That is where I started from but I think it morphed into me putting a lot of myself into the writing and, in some ways, all of the characters are different parts of myself. I think the main theme that ties the film together is of feeling like an outsider. The four main characters in the film learn that even though they don’t fit in with the world as a whole, they fit in with each other. And that is ultimately better as they can be appreciated with all their own unique individual quirks. 2) How did you assemble your team and get the funding? Who did you get on board first, and how long was the filmmaking process – from development to principal photography to post? Which was the most difficult and which was the most fun? (BRYAN:) I spent the first nine months after I finished the first draft of the script working on my own and managed to cast Mirren Burke, Claire Garvey and Sylvia Syms; as well as attracting finance by holding fundraisers and pre-selling DVDs and premiere tickets. I also set up an investment share scheme by that time and, as well as investing my own savings, I convinced work colleagues, friends and family to invest in the film. This was all part of my “Get on Set in Nine Months” after finishing the script plan. The script took about five months to write so that would be about 14 months into the process and would be about October 2008. At that point I took the hard decision to postpone the shoot as my one man army ran out of time to have everything ready to go. I set a new date of February 2009, another five months, to be the first day on set and kept going. At this time I met the film’s producer Sam Alani who worked at the same company that I worked for and he was just leaving to try to become a full-time film producer. I worked a full-time job as a computer programmer throughout this whole process. Jordan came on board pretty soon afterwards and we found Rollo Weeks around that time as well. We stayed at this small number till January when we had secured most of the funding, but were struggling to find that last little slice to push us over the line. I had two and a half months booked off of work so we decided that it was now or never. We eventually shot the film in March 2009 in 19 days over a three-week period. The run up to the shoot was hectic as you can imagine, but somehow we managed to assemble a great team through a lot of hard work. I can remember we finished the shoot and I was back at my day job about two days later which felt really bizarre. We spent about six months editing the film and another six months doing the sound design, writing the score and grading the finished film. So from picking up a pen to having a finished film it took two years and nine months to have a finished film. Each part had its difficult moments but one sticks out more than others and that was when we lost our principal location at the end of our first day on set. We were filming in a 1920’s period mansion block of flats and we had permissions from about four different organizations. But when we turned up on the first day another one that supposedly ran the complex started to complain. I think his aim was to try to extort money from what he had assumed was Hollywood arriving on his doorstep. I still don’t full know if he had the rights that he claimed he had, but after a few calls between lawyers we were informed that we couldn’t shoot there anymore. I found this out at the end of the day as the producers frantically tried to deal with the scenario. I can remember feeling completely gutted at hearing the news. Luckily, our producers and location team did an amazing job and found a new location in two days; the art department had a day to get it ready and, four days after being shut down, we were back up and filming again. Lots of moments were fun in hindsight but at the time you are so focused on the million and one things that you have to deal with that I am not sure I could call them “fun”. It was amazing to see the very first cut of the film as up until then it is all just words on a page or scenes that you are shooting as quickly as you possibly can to meet a ridiculous schedule. That is the first point where you can sit down and watch it as a movie and to know whether all the choices you have made have paid off. Luckily for me I was happy with the results! 3) Tell us about your cast (which seems genetically made for this story). How did you find them, and what was a genuinely funny moment that stands out from directing the film? (BRYAN:) They all came from different places really. I was friends with Mirren Burke and she was doing acting training in New York when I was writing the script so I had her in mind for the role of Ailidh early on and was discussing parts of the film with her during the writing process. Mirren possessed all the right ingredients to play Ailidh and from the beginning I couldn’t imagine anyone else in that role. It’s her first film. I am sure when other people see her performance she won’t be short of opportunities for more roles. Claire Garvey came from a set of auditions that I ran in a warehouse that I had hired to run a series of fundraising events. By day it was a casting studio and by night it was a comedy venue, music venue and a fancy dress party. I got all of the actors to prepare a monologue and Claire did a voiceover from Monster and during that I could see Jacqueline in her. She also spoke to me about the character in such a way that I knew that we would work well together and could get our ideas across which is so important. Sylvia Syms has been in more films than years I have been alive and I wanted to find such an actress to give some weight to the role of Mrs. Nicholls. I wrote Sylvia a letter and sent her the script. Much to my surprise, she was interested! I think she joked that she decided to take this part as she isn’t killed off in the end. The role of Jacob was easily the hardest part to fill and we auditioned a lot of different people for the role. Then we came across Rollo Weeks. I hadn’t seen any of his previous films where he was a lot younger and I nearly didn’t see him as most of the photos of him online are of him as a young boy and even the headshot we received was probably taken a few years prior. Getting a bit desperate, I agreed to see him and I was glad I did as he was perfect for the role. In some ways, he lets all the strong female characters be themselves without feeling he has to overpower them, and this trait was central to who Jacob is. A funny moment − not so funny for everyone else, but I made the decision that the two girls (Mirren and Claire) shouldn’t speak to each other during the shoot. Their characters don’t know who each other are in film so I wanted to mimic that in real life. That provided for some awkwardly comic moments for me, at least where they tried their hardest in the smallest flat in the world to not look each other in the eye. 4) In comic book parlance, the Director of Photography is like the illustrator for a comic book − your Ailidh, so to speak. How did you connect with Jordan Cushing who is already amassing some impressive indie credits? (BRYAN:) I was meeting with a number of DoPs (or cinematographers!). I met Jordan at a local cafe which we frequented a number of times after that as by chance we lived about 342 steps from each other. Those are Jordan sized-steps by the way. Throughout the project there were a number of people who were key in helping me to achieve my goal of making a film, but Jordan played such a huge part that he is the first person I would call to get a second opinion. The first night we met the manager of the cafe ended up throwing us out. We stood outside the cafe talking for a bit after that as well. Jordan just really got what I was trying to achieve straight away and then continued to try and understand as much as he could into what I was looking to do. It meant that when we got on set and I mumbled something indecipherable, Jordan knew exactly what I wanted and was able to bring ideas to the table that complimented −or were better than − my own. As a film-maker, you would be foolish to think that you are the only one person who can have great ideas, and Jordan was my Go-To-Guy for great ideas. 5) Jordan, what attracted you to the project? And what did you shoot with? (JORDAN:) The real draw to the project for me was the level of commitment and enthusiasm that Bryan showed in the early days of getting the film off the ground. I meet a lot of first timers with a script and a dream who are casting about for Producers to swoop in and bring it to life for them. As far as I’ve seen, that just isn’t how it works, so it was refreshing to find someone who didn’t come from a film background who was really driving his project forward despite not having the connections or experience that other people might take for granted. Bryan had already attached some investment, had organized fundraisers, had a terrific website up and running, and had worked through pages and pages of notes on every aspect of the film. There didn’t seem to be any doubt that he would get the film made. And whenever that happened, this wasn’t a guy who was going to let it sit on a shelf. He was going to go to the wall to get it in front of audiences. You have to respect that, and that’s infectious. 6) By the way, which is it − Cinematographer or Director of Photography? And what preparation is required for someone in your shoes to be ready to shoot on Day One? (JORDAN:) I’ll answer to either one… I like to think I’m always a cinematographer but I’m a Director of Photography when I have a bunch of people to help me be that. When it’s me and another guy, it seems a bit grandiose, don’t you think? 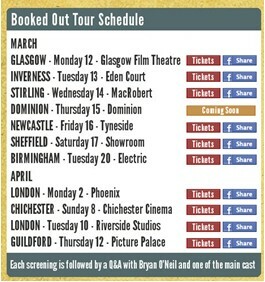 7) Bryan, the film is in the can and your website shows that you are getting ready to go on tour soon. How have audiences responded thus far? And how do you plan to distribute the film for more mass consumption? for a weekend in four cinemas like a lot of limited theatrical release films do, that I would set up a tour over a three-week period where I would take the film around the UK with one of the actors coming to each screening and holding a Q&A afterwards. This made more sense to me as then I could make each screening special and the hope is that by making each screening a special event that the word will spread about BOOKED OUT. Only time will tell though! 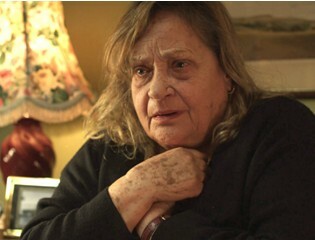 For distributing the film beyond the UK we just signed with a New York-based sales representative called Locomotive, which is headed up by Coleen Seldin who spent about ten years handling film sales at Miramax, so the film is in good hands for securing distribution outside the UK. We just signed recently so it’s still early days on this. But there has been interest already in a number of countries so hopefully there will be some news shortly about BOOKED OUT coming to a city near you. To help this process we have just created a DemandIt page(http://eventful.com/performers/booked-out-/P0-001-000559049-1) so that everyone can demand that BOOKED OUT comes to their town. This can only help convince distributors that there is a market for the film. 8) The female characters in your story − young and old − are so strong, organic and well defined. How did you get inside your character’s heads? Did you have five sisters growing up … or is it something that just came natural? (BRYAN:) I never had any sisters, or lots of female friends for that matter, but I purposefully wanted to write exciting female characters and that was one of my goals right from the outset. 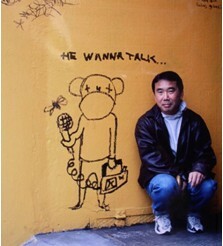 My favorite author by a million miles is Haruki Murakami. One of the things that I love about his novels is that he has these wonderfully unique female characters and I wanted to emulate that. I would like to think that the three main female characters within BOOKED OUT could quite easily live in the world of one of his novels and not stand out. In terms of the elements that make them unique, I think that came from areas within myself and I emphasized and pushed in different directions to get the result that I desired. A lot of the films I watch have strong female characters, so there must be something that gravitates me in that direction. 9) Jordan, in shooting a character-driven story like BOOKED OUT where there are so many different personalities, what is the trick of capturing each of them? For example, Ailidh is so care-free and Jacob seems so constrained. How did you collaborate with Bryan to capture each of their personalities and perspectives on film? (JORDAN:) Pretty early on in prep we contrived that we would give each of the women that hold sway over Jacob a different treatment. These things were drawn from each of their characters and hopefully emphasize their differences. For example, Ailidh is carefree and exuberant but also a bit erratic, so her stuff is all handheld and much busier and more colorful. This applied to the art direction and costuming too, so hopefully those all work in concert. Sara Ranieri and her team did a terrific job creating the homes of the characters as did Sophie Howard clothing them all. I also always like to have a visual journey plotted for a film that hopefully reinforces the emotional arc. So it was natural that these two things could work together and, as the film progresses and the characters become intertwined, so too does the visual treatment. By the end they’re all in the same unified visual world. That was the theory going into it at least, and even when we weren’t slavish to it, that concept informed the decisions we made right through post. 10) Bryan, this might be a silly question, but for us clueless Americans, what exactly does the title BOOKED OUT imply in regards to the storyline other than Ailidh, the main character, is a graphic novelist? (BRYAN:) That is where it came from, to be honest. In the initial drafts Ailidh’s novel had a bigger part and at one point I was thinking of filming her story as an animation that ran alongside the main film, but I reigned that in as it felt like the film was losing focus. I guess if you worked in marketing, you would probably say to change the name but as a filmmaker it’s hard at this point to let go of it as the name is synonymous with the film now. (BRYAN:) That’s right. So the title was referring to Ailidh who has finished her graphic novel but is apprehensive about releasing it to the world. So in essence she is “booked out” with the novel. No one would normally use the phrase to describe her as such, but it was a play on words so that I could get the word “book” in the title − and frankly, I think it suits the film well. (JORDAN:) Plus, for VOD, the titles at the beginning of the alphabet always get more rentals. (BRYAN:) Fantastic! Yet another good reason for this to be “BOOKED OUT”. 11) Bryan/Jordan − this question is for both of you. What other films would you compare BOOKED OUT to? (JORDAN:) That’s a tricky one… one of the references we watched at the outset was Ghost World so there may be some echoes of that. I also got Bryan to watch Mystery Train though the movies aren’t really similar. It makes me think of Lost in Translation for moments but then also something like Garden State. I think there’s something that unifies all those titles but I’d be hard pressed to put my finger on what … whatever that nebulous quality is, BOOKED OUT hopefully has a healthy dose of it too. (BRYAN:) The other night I was in bed unable to sleep with all the tour preparations going over in my mind and I thought that BOOKED OUT is like as if an early Mike Leigh had made Amelie… then I thought I was probably getting ahead of myself and that instead of thinking such things I should actually be sleeping. I think it has elements in common with the films Jordan mentioned but would add to that Science of Sleep, Submarine and It’s a funny kind of story. 12) Bryan, what project(s) are you working on next? And in what capacity − as a writer, director or both? 13) Jordan, tell us what you’ve been up to. Truth be told, LOVE’S KITCHEN inspired me to get onboard with Bryan and BOOKED OUT as I was hankering to do a romantic film that was a bit more off beat. BOOKED OUT fit the bill and was a fantastic experience. I suggest you rent both films and then, if you’re up for a bit of a scare, watch 13 HOURS! 14) Bryan, what was your marketing strategy to create a buzz about BOOKED OUT? Did you use Social Media? Did the bands from the soundtrack help generate a built-in audience? 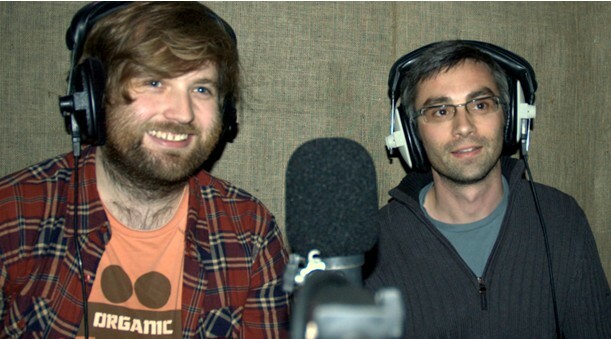 And how important is it to have really cool music on an indie film? (BRYAN:) If there is a social media platform that I know about, then we are on there. But my approach to using it is to always respond personally to the fans so if anyone tweets or writes or our Facebook wall then I will also respond as me first and foremost rather than pretending we are a huge film. Most of the fans we have seem to like that and we talk quite regularly. I also try not to overly promote the film as personally that grates on me a bit when other films are always demanding that you do things for them (i.e., retweet this, send this to all your friends, etc). I think it’s better to provide good content or discussion and if they want to share things, then they will do it off their own back. With the release in the UK coming up I am trying to line up some special competitions and promotions to go alongside it so over the coming weeks we will be running those to help to spread the word and we have some exciting companies that have sponsored our tour that we will be announcing shortly as well. The bands that are on the soundtrack have been great so far and hopefully they will support the film a lot in the coming weeks. I chose all of the music in the film myself and it’s one area I am particularly proud of. For BOOKED OUT, having a great soundtrack really helped bring the film up another level and if you listen to the score or soundtrack (www.bookedoutfilm.com/music) you can really get a feeling for what the film is all about and that is invaluable. 15) Last question − when will we be able to get our mitts on BOOKED OUT in the States? What’s the best way to help get the word out and request to see the film? (BRYAN:) Hopefully soon! Our sales representative I mentioned previously is talking to a few companies in the States, so it really depends on how that comes off. If that doesn’t work, then I may just get my film and a backpack and head over in a similar way to what we are doing in the UK. The best way to spread the word is by becoming a fan on our Facebook page (www.facebook.com/bookedoutfilm) and demanding the film comes to your town via DemandIt (http://eventful.com/performers/booked-out-/P0-001-000559049-1) as it’s things like these that can help sway the distributors to buy the film. Gentlemen, it’s been a fantastic interview. We wish you much success with BOOKED OUT, as it looks like quite a gem. We’ll be looking out − or “booking out” for it. Thank you for your time! An award-winning indie comic creator and screenwriter, Bob Heske is currently writing/producing a micro-budget horror film called UNREST (http://www.indiegogo.com/unrest). Bob wrote THE NIGHT PROJECTIONIST, a vampire horror series to be published by Studio 407 (http://www.studio-407.com) with film rights optioned by Myriad Pictures. Through his Heske Horror shingle, Bob self-published his critically acclaimed horror series COLD BLOODED CHILLERS. Bob’s trade paperback BONE CHILLER (a “best of” CBC anthology) won a Bronze medal in the horror category at the 2009 Independent Publisher Book Awards. His “end times” anthology 2012: FINAL PRAYER was also released in late 2009. 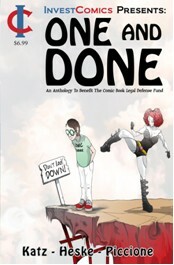 Bob was editor and contributor to InvestComics’ ONE AND DONE charitable anthology. Buy it here.